INTEGRATED ANCHOR POLE SYSTEM: 1.5 inch (35mm) dia. two-piece white powder coated & rust resistant aluminum pole (Total Open Height 85 inches) with thicker tubing wall ; HEIGHT ADJUSTABLE to lower the umbrella closer to the ground to get more shade and help resist winds. The integrated anchor (sold as option) screws into the sand or turf and makes your umbrella much more secure. WIND PROTECTION : Air Vent Design to direct air upwardly and laterally from the umbrella, which relieves the pressure on the interior of the umbrella to prevent it from being turned inside out. DUAL FIBERGLASS RIB STRUCTURE for resistance to windy conditions to prevent the canopy from being turned inside out. Its non-corroding fiberglass ribs provides more flexibility that will not kink or bend of shape (like steel ribs) providing steady, reliable protection during windy conditions. ACCESSORY HANGING HOOK Included (keep all of your belongings eg. Towels/Camera/Bags dry and free of sand!) 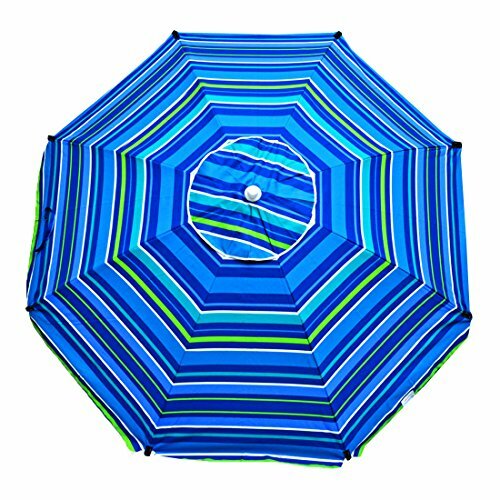 ; Tilt mechanism (Chrome Finish) allows the umbrella to track the sun and maximize your shade all times of the day ; Folded Umbrella length of 54 inches ; Lightweight of 5.9 lbs. (including carry bag with shoulder straps). MORE SECURED - Innovative reinforced rib connector to hold outer end of fabric to canopy and its tie knot straps to ribs unlike manual sewn thread loops found in other umbrellas which easily opens in windy conditions resulting in damaged umbrella! 100% SATISFACTION GUARANTEED - 90 day WARRANTY - Must see it to believe. If you have any questions about this product by Shadezilla, contact us by completing and submitting the form below. If you are looking for a specif part number, please include it with your message.